The iPod yocto is Apple's 1,337th digital audio player this year. It was introduced Tomorrow* as a part of the company's newest line of fun-time gadgetry**. The yocto is the smallest possible iPod: any smaller iPod wouldn’t make sense physically. It is based on yoctotechnology, which is smaller than nanotechnology. Its width and length are physically impossible to measure simultaneously, and it is the first known digital audio player to weigh less than air. We cannot properly say the universe began until one iPod yocto had been manufactured. The iPod yocto was launched under the slogan "You have got to be kidding me... No seriously we have a lot of time on our hands"
Not only this, but the player holds such a high amount of songs (0.5 song) that our whole lives couldn't be spent listening to them all. Apple are known for making machines with gobsmackingly useless capacity which is hardly dented by your entire music collection, so this is an innovation. It is the first iPod ever made that can fit inside of a bellybutton and still leave room for the yocto recharge kit, yocto amplified speakers, and yocto cell phone conversion kit. It was launched in two colors: burnt sienna and mustard. * This author does NOT engage in insider trading. ** May not actually be fun. Sell! Sell! Sell! The iPod yocto, seen at zoom times 2,400. Mega audio: For the first time, users can listen to the songs on his/her iPod using mega audio, which is far superior to normal audio. The only difference is relative volume. Mini headphones: These extremely tiny headphones absorb into your eardrum, much as an iPod Yocto goes into your skin. They connect to the iPod Yocto via your bloodstream, and when that fails (usually during heart attack or stroke), Bluetooth Wireless technology. Easy transport: Users no longer have to deal with clunky iPods that can barely fit in their contact lense cases. Now iPods can be taken anywhere, including submarines, contortionists' containers, and clown cars! Self-attachment: The iPod Yocto halfway osmoses onto your skin, so it won't ever come off. Fission batteries: The yocto may weigh less than your grandma's eyelash, but thanks to Einstein's atomicalious formula: E=mc2, you can be sure it has the radioactive juice to power a small city. New click wheel: The click wheel now merges with the grooves that make up your thumbprint. This doesn't really do anything except tell the police that you were listening to Cher when you knocked over that 7-11. Super Shuffle Technology: Super Shuffle Technology randomly replaces songs with ragtime tunes covered by William Shatner. Never hear the same boring song twice! 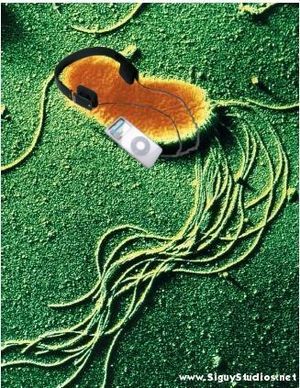 Osmosis recharge: The iPod yocto can actually fit itself through the user's plasma membrane, using ribosomes to charge up its batteries with protein, or something about biology. DNA immersion: The yocto immerses itself in the user's DNA and automatically downloads iTunes based on the user's genes! If the required music cannot be found, the users genes can be altered to better reflect iTunes' selection. Armour Plating: The iPod Yocto, when placed alongside any number of its counterparts, will forge an ionic link with them, increasing the volume by around 1000 times. When combined with enough Yoctos, the giant iPod suit can be worn as armour, proven to be able to absorb shorts from even the strongest of day-old kittens, and withstand temperatures up to, not including, 24 degrees celsius. Forge an army of Yocto wearing fanatics, and invade the nearest supermarket in the latest of musical style! Wireless communication : As a result of the Bluetooth Wireless Technology, the iPod yocto can be used as a cellular phone in case you get bored with your music. This is a huge step in technology because for the first time, it allows people all around the world to have their phone conversations on full blast whilst using public transport. Easy to read screen: The salmonella making its home on your hand can now easily see what mindless rubbish you now listen to. The reaction was extremely positive at the announcement, and over three billion units were sold, generating over 19 quadrillion pesos in revenue for Apple. eBay took a hit, as several million old iPods went unsold. Market analyst Steve Ballmer noted, "I love iPod yocto. I love puppies. I love all people. We need more love, and less hate. Spread peace!" He also wishes death on many people. The IPod yocto is the best consumer device ever created. The Chinese government banned this player due to Apple's alleged plan to overthrow the existing regime by selling the yocto cheaper than the chinese copycats. Most customers wondered why they could not see their iPod, which would be different than the picture on the box. Apple responded with a press release stating, "Box images not to scale." About 99.192% of costumers complained of losing their iPod within seconds of opening the package. A few customers reported accidentally eating their iPods, and only knowing of the ingestion when diagnosed with silicon poisoning. Some customers also reported minor cracking of the screen during the osmosis process. This page was last edited on 24 August 2012, at 06:07.